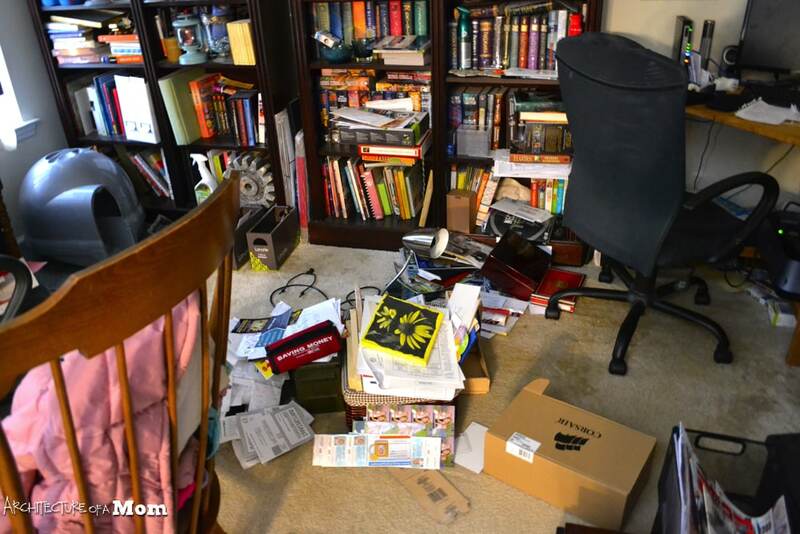 I share my home office with my husband, but we rarely use it. It has become a dumping ground. 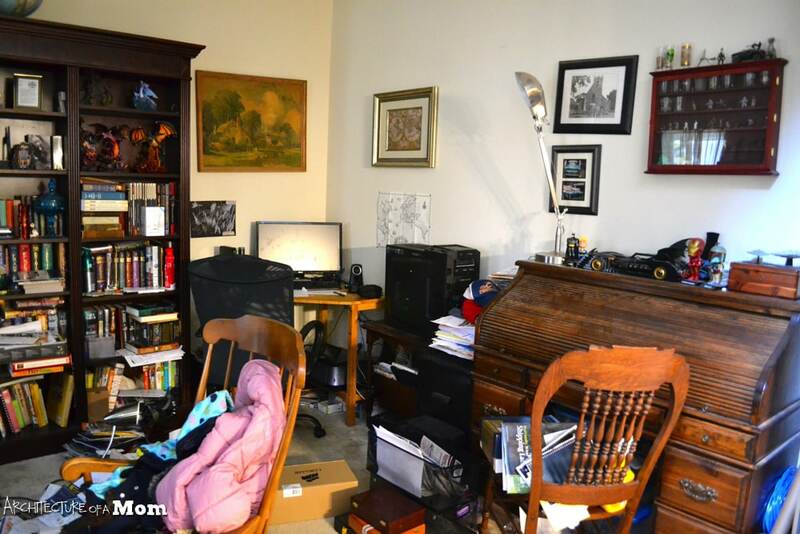 We have bad storage, two beautiful bookshelves that are full, the cat litter (yuck), and 3 desks–for two people. 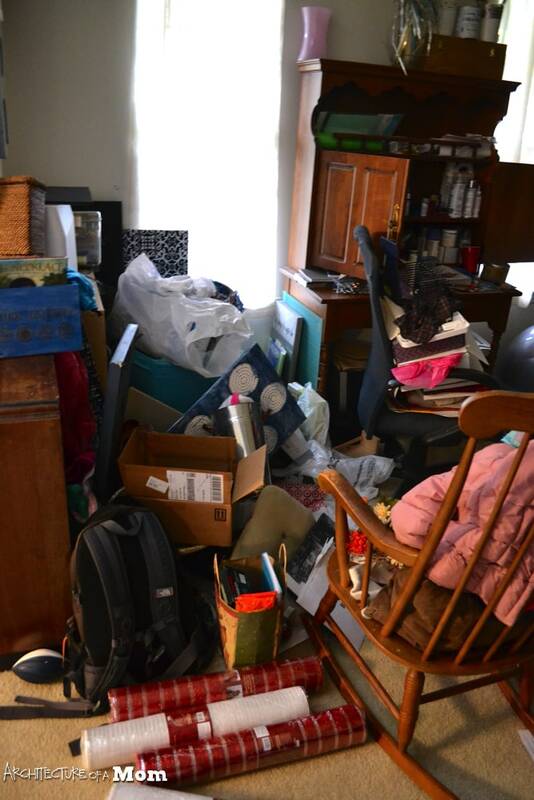 It needs a major overhaul, and I need a kick in the hiney to get motivated. This is my first time joining your challenge, but I’ve been following along the whole time! I need to make it beautiful so we’ll want to keep it up! 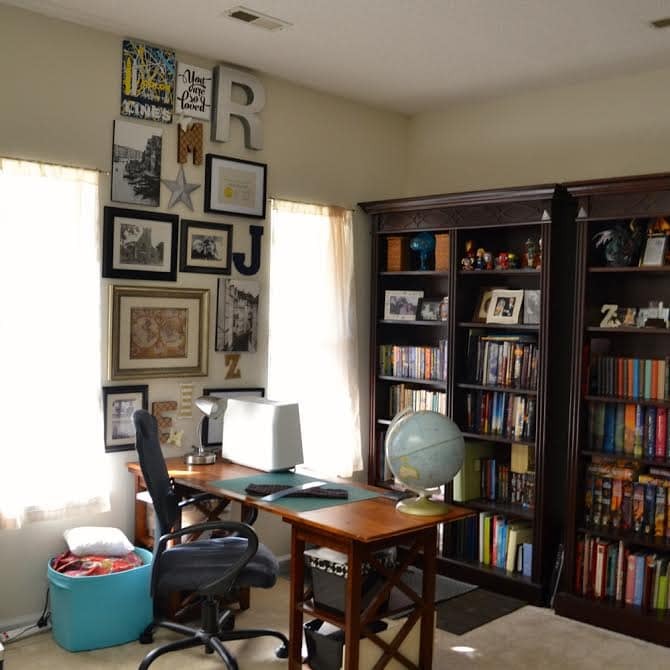 This is an office/library that I share with my husband. 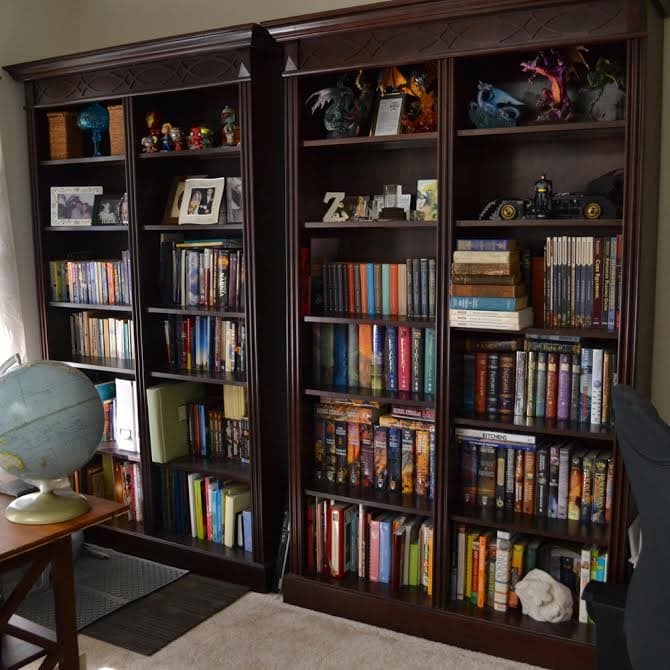 He loves the dark wood look, and when we had to replace both of our furnaces a few days into the challenge, I knew that the budget was minimal. Also, my hubby wasn’t ready to make significant changes to his “side” of the room. But I dug in and started cleaning. 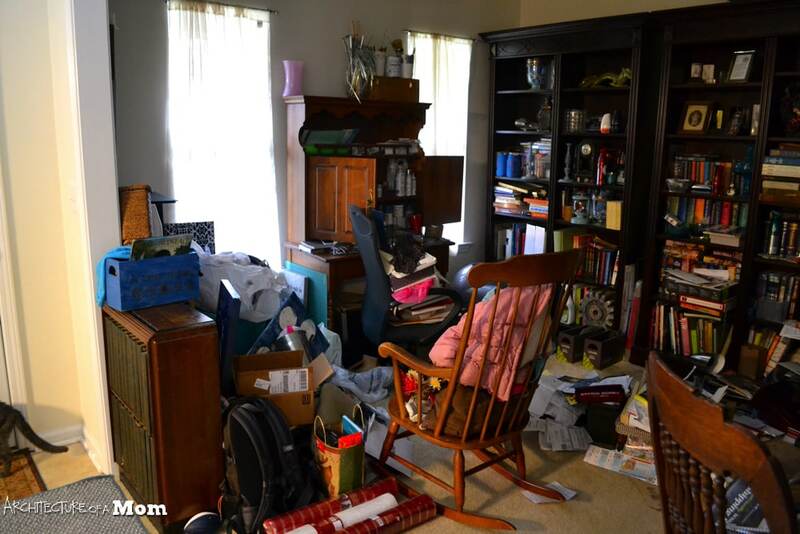 I threw out a bunch of stuff, put away loads of items that belong in other parts of our house, and finished several half-finished projects to get them out of the room. We reorganized the bookshelves to accommodate my husband’s bobble head, dragon, and lego collections. 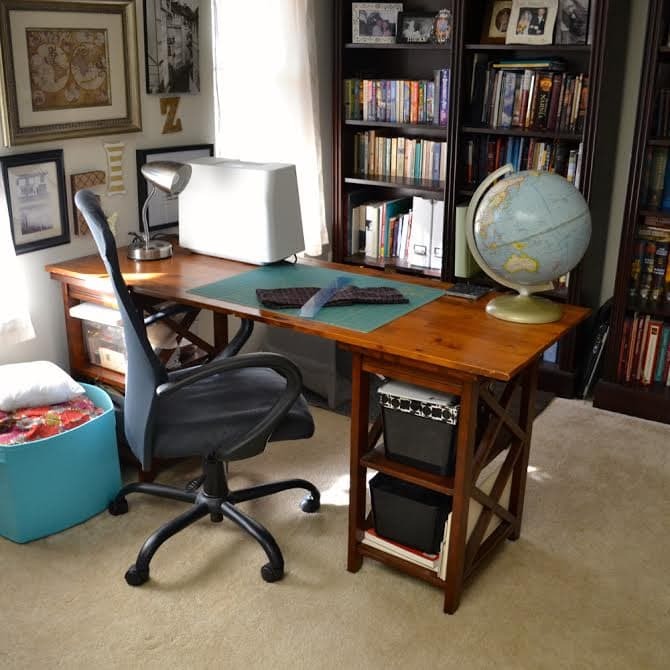 Once I had a blank slate, I started on projects in the room. 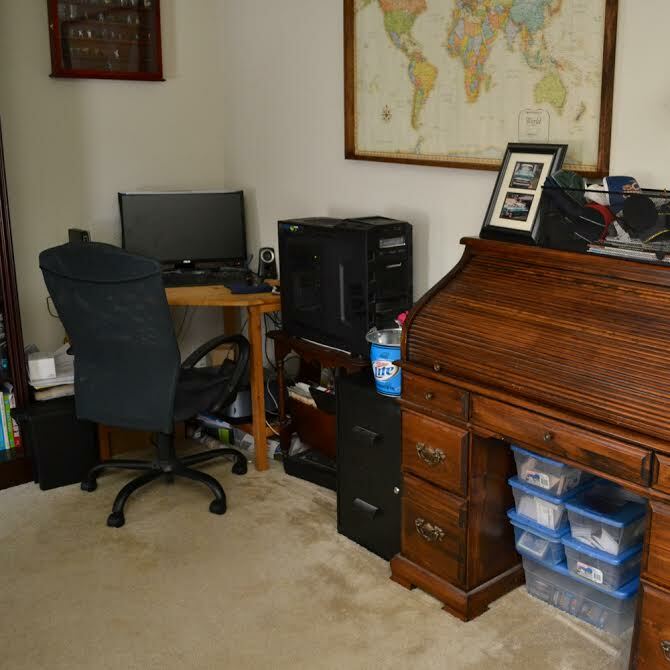 After striking out at several thrift shops, I “shopped my own house” and found the perfect desk: it’s two end tables and a wood scrap!! I love that the wood already matches most of the wood tones already in the office. 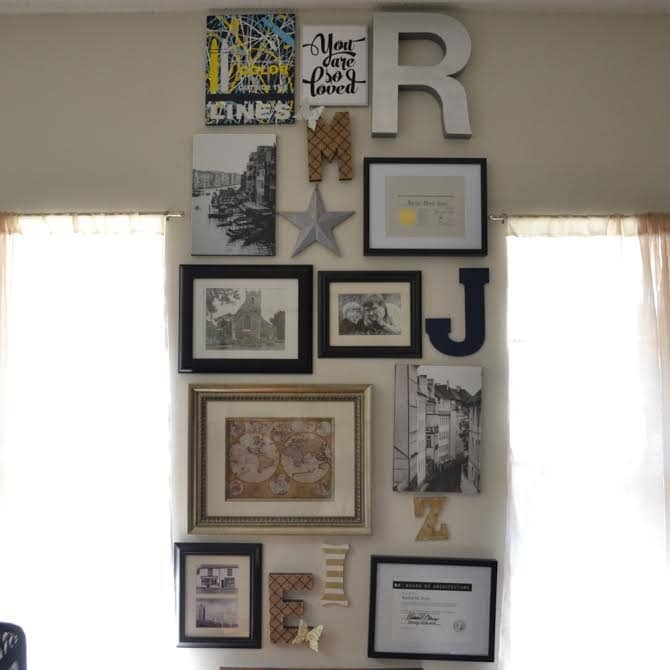 And then, I got to work on using the pieces of art that I had to create a gallery wall. I had several projects I had made for my blog (Architecture of a Mom) over the last few months, as well as some gifts and old photos my father-in-law had taken when they lived in England. I even framed and hung up my architecture license (and I’ve only been licensed for 6 years–way to be proactive). My storage unit/command center is an old shoe organizer with “drawers” made from wallpaper sample boxes I painted with chalky finish paint. On that, I have a command center that is made from an old frame, a calendar, and some sheet metal with homemade, coordinating magnets. 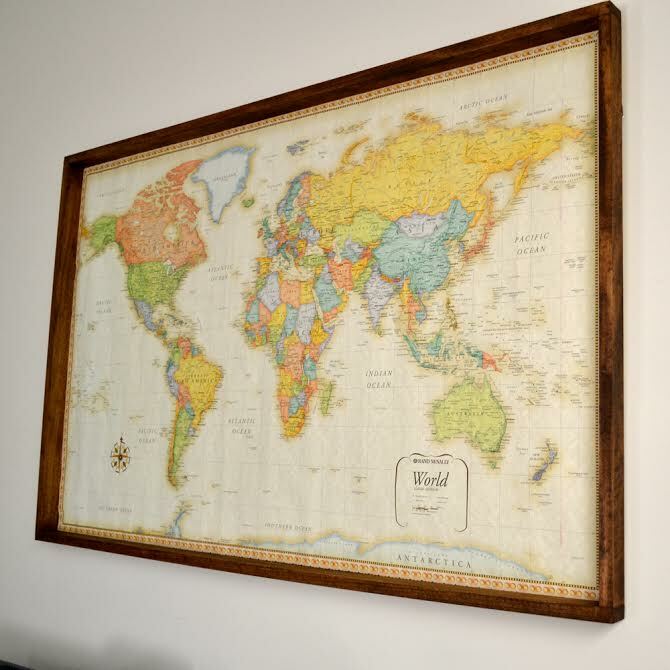 The final project was to frame a map that we bought before we had kids (my oldest is 7!). It’s expensive to get large format items framed, so I made my own frame from 1×2 poplar. 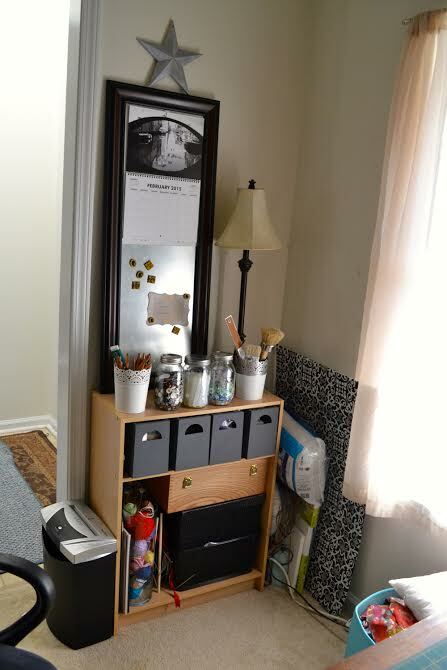 I’ll be sharing how to make this (surprisingly simple) project at my blog Architecture of a Mom ( http://www.architectureofamom.com ) as well as other projects in this room makeover over the next week or so! So what did I spend on this project? With taxes and all, around $49 dollars. This included a couple of frames, wood and screws for the map frame, and some picture hanging hardware. Everything else was stuff I had on hand! 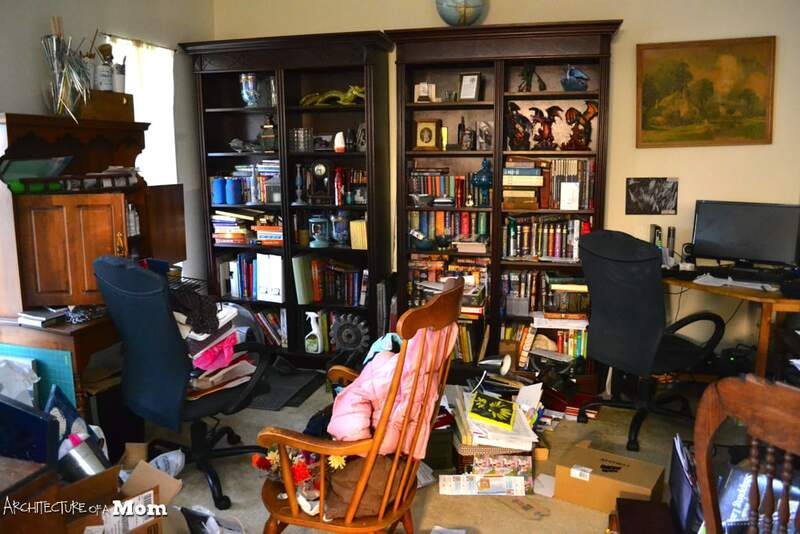 And really, the biggest change was getting rid of the clutter. Great job!!! What a dramatic makeover!